Friday, Judge Bernard McGinley of PA Commonwealth Court (see http://www.inquirer.com/local/pa/220015271.html) once again temporarily barred enforcement of last year’s Voter ID law. Didn’t overturn it, didn’t give a permanent injunction, didn’t make it unconstitutional, just barred enforcement pending a final determination. Gotta think about it some more. What’s to think about, other than how to explain his lack of fealty to the Republican overlords of the state who bragged about how the law would give PA to Mitt Romney last year? What, exactly do you need to scratch your head about in regards to a law designed to keep registered voters from voting? 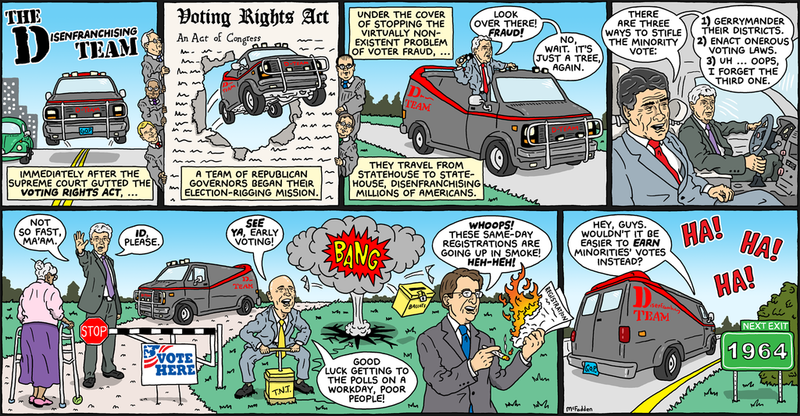 Now, one of my Republican friends (yes, I have Republican friends) insists that the law is there “To keep Mickey Mouse from voting.” That is, he thinks that the law was passed to protect us from people (or rodents) who aren’t legitimate, registered voters. Well, I don’t want M. Mouse, or Ben Dover, or Walter Melon coming and voting in Chadds Ford either. But the thing is, we already have a way to keep them from voting. It’s the list of registered voters that is given to every polling place. If you aren’t a registered voter, you’re not on the list. If you’re not on the list, you don’t vote. You can be a 4-star retired general with a pocketful of picture IDs including signed pictures of yourself with the president and the pope, BUT if you’re not on the list, you don’t get to go in the booth and push buttons. And, if you ARE on the list, the state has determined that you are a duly registered voter in that precinct. The Voter ID law kicks in only at that point, when duly registered voters come to vote. The law says that they need to show certain forms of ID (which conveniently are less likely to be held by the young, poor and elderly) to prove that they are in fact that registered voter—and not someone else impersonating them. And, despite having over a year to provide the court evidence that voter impersonation occurs in PA (and hence would need to be blocked by an ID law), the state has come up with precisely zero cases of voter impersonation in PA. But the plaintiffs in the case are actual people who are registered voters who have legitimate reasons why they either cannot get or have extreme difficulty getting the state-mandated ID. So we have clear harm (not just theoretical) from the law and not one bit of benefit. What’s to think about, Judge McGinley?